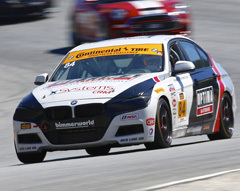 With a chance to show the full measure of BimmerWorld’s in-house-developed turbocharged BMW 328i platform on the renowned Road America circuit, the Virginia-based aftermarket and tuning specialists captured a compelling fourth-place finish with the No. 81 entry driven by Andrie Hartanto and Tyler Cooke. Cooke, a young veteran, and Hartanto, a rookie in IMSA’s Continental Tire Series, have formed one of the most competitive duos in the Street Tuner class, and with their near-podium at Road America, they captured their best result of 2015. By finishing fourth on the 4.0-mile Wisconsin road course, Cooke and Hartanto also earned their fourth top-10 result in the last five races. With Hartanto qualifying and driving the opening stint and Cooke taking the closing stint, team owner/driver James Clay says he’s genuinely impressed by the performances coming from the pair in the No. 81 BimmerWorld BMW. Despite his relative lack of age, Cooke has become a fast and reliable team leader with the No. 81 program, and with his promotion to the role of closing driver this year, he says the responsibility of pushing the turbo BMW to the finish line has become a pleasure. Hartanto’s spirited drive to start the race had a minor complication, but as he recounts, it just meant he got to pass more cars. Clay and teammate Jason Briedis weren’t as fortunate as Cooke and Hartanto last weekend, but in typical BimmerWorld fashion, their No. 84 OPTIMA Batteries BMW 328i contributed to the ongoing growth of the company’s knowledge base and product offerings for the F30 platform. 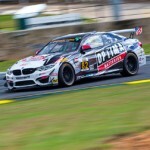 BimmerWorld’s season of rapid development with BMW’s new turbocharged 328i platform continued last weekend at Lime Rock Park where both entries in IMSA’s Continental Tire Series scored top-10 finishes. The No. 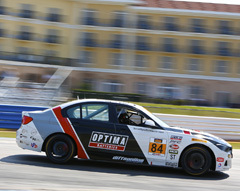 84 OPTIMA Batteries BimmerWorld BMW 328i piloted by team owner James Clay and co-driver Jason Briedis raced to sixth-place at the tiny 1.7-mile road course, and came close to matching their season-best run to fifth at Daytona. The sister No. 81 BimmerWorld BMW 328i shared by Andrie Hartanto and Tyler Cooke followed the No. 84 home in ninth, which marked their third top-10 finish in the last four races. 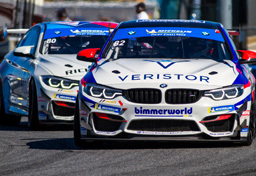 The Virginia-based BMW aftermarket and tuning experts have led the charge with the brand’s F30 chassis in competition, and as with everything BimmerWorld races, the knowledge gained will benefit their customers in the form of race-proven components. 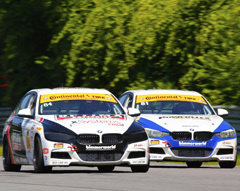 A recent heat wave in Canada and Lime Rock has helped BimmerWorld to make advancements in heat rejection under the hood, and as Clay explains, the process will continue through the remaining rounds. 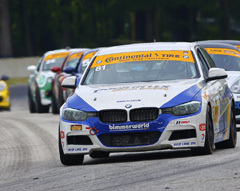 BimmerWorld transitions from Lime Rock to its next race at Road America in Wisconsin on the weekend of August 8-9. The sprawling road course is a favorite for most drivers, and holds special meaning for Clay, who won his first professional race at the circuit. 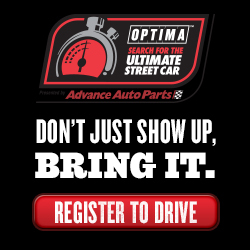 The track is also near the corporate headquarters of OPTIMA Batteries, and with its high demands on handling, power, and braking, BimmerWorld’s BMW F30s are primed for a competitive run. 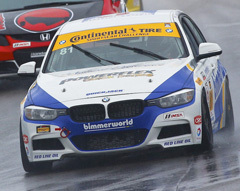 After racing at Road America in BimmerWorld’s E90s, Cooke can’t wait to lap the 4.0-mile track with Hartanto in the No. 81 BMW F30. “My favorite corner there is Canada corner; my dad always told me stories about hearing the race cars scream down the straight after the kink into Canada corner and I finally got to experience it myself and it was truly amazing,” he noted. 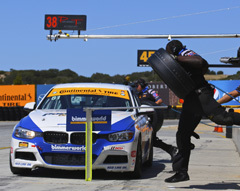 With little to report that could be described as positive, team owner/driver James Clay says his staff of BMW aftermarket and tuning specialists at BimmerWorld have already shifted their focus to fighting for a win in Canada after wet and unpredictable weekend at Watkins Glen with their turbocharged BMW F30s. An incident at the start of the race involving Clay’s teammate in the OPTIMA Batteries car saw the No. 84 BMW trigger a track-wide caution period moments after the 2.5-hour contest began. Despite an impressive sixth-place qualifying position, the No. 84’s day was done as soon as it started. Once the action resumed, Andrie Hartanto showed his wet weather prowess in the No. 81 BimmerWorld BMW F30 and battled towards the front after starting fifth in class. Visibility issues would eventually hinder his teammate Tyler Cooke in the run to the checkered flag, and he managed to hold on for an unsatisfying 14-place finish. “The rain always brings its challenges,” said Hartanto. “Watkins Glen, in particular, is massively challenging due to the amount of mixed surfaces you drive across. When you incorporate some serious rain into the mix, those grip differences demand that you stay on top of your game. 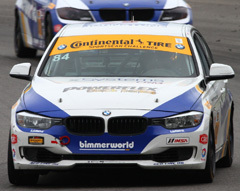 Keeping busy during the most recent hiatus between Continental Tire Series events hasn’t been a problem for the BMW tuning and aftermarket specialists at BimmerWorld. With two months to fill between the race in Monterey, CA. and this weekend’s contest at Watkins Glen in New York, team owner/driver James Clay says his veteran crew of technicians and engineers has focused on improved durability for the turbocharged engine found in their BMW F30 chassis. BimmerWorld newcomer Andrie Hartanto has impressed at every round he’s contested in the No. 81 BMW he shared with Tyler Cooke, and like all of the earlier events on the calendar, he’ll race at Watkins Glen in the F30 chassis for the first time. Now in his second year on the pro racing trail with BimmerWorld, Jason Briedis, who shares the No. 84 OPTIMA Batteries-sponsored BMW 328i with Clay, reflected on how far he’s come since joining the Continental Tire Series in 2014. 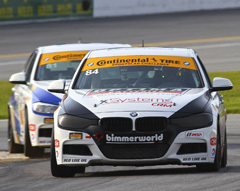 Almost a decade of BimmerWorld’s race-winning research and development with the E90-based BMW 328i platform has been distilled into to its newest challenger, the turbocharged BMW 328i built on the F30 chassis architecture, which will comprise both of the team’s Continental Tire Series entries in 2015. BimmerWorld owner/driver James Clay and teammate Jason Briedis spent 2014 developing the F30 in the Street Turner class, and with a successful test on Jan. 9-11 at Daytona International Speedway to draw from, BimmerWorld’s revised two-car lineup is prepared for a strong opening to the 10-race Championship. The Clay/Briedis combo will continue in the new No. 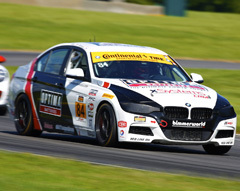 84 OPTIMA BMW 328i, and will have team veteran Tyler Cooke and impressive newcomer Andrie Hartanto alongside in the No. 81 BimmerWorld BMW 328i at each round. BimmerWorld’s four-car effort from 2014 has been reduced, but the size of Clay’s race operation hasn’t changed. His new Next Level European team debuts at Daytona with a pair of Porsche Caymans in the ST class, and despite the dissimilar brands, he says both camps will contribute to a solid overall showing. Cooke: The cars at the test demonstrated a good pace and really showed they had something for the rest of the cars in the field. I’d be satisfied with top-5 and top-10 performances throughout the year which would help us big in the Championship. A good, consistent season can have a great outcome at the end of the year. Hartanto: After a strong showing at the test, I’m very optimistic of our prospects for the 2015 season. My first impression of the BimmerWorld team was great. While I’ve always been incredibly passionate about racing, this has been the most excited I’ve been to kick off a season for a while. Tyler is a strong driver and I believe we have one of the strongest pairings in the series. I still need to acclimate myself to the higher level of competition, especially under race conditions, so it might not show in the first race. However as the season goes on, I’m confident that we will prove that we’re a championship contender. TV TUNE-IN INFO: IMSA.com, Live, Friday at 1:45 p.m. ET. 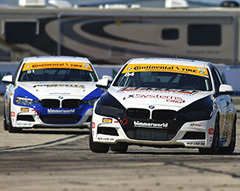 Recent news from the front-running Continental Tire Series BimmerWorld Racing team confirmed the veteran program would field two turbocharged BMW 328s next season, and drivers for both cars have now been nominated by the perennial Championship contenders. Team owner/driver James Clay and Jason Briedis, who made his Street Tuner debut in 2014, will continue in the No. 84 BimmerWorld entry built on BMW’s F30 chassis platform. They will be joined by BimmerWorld’s young veteran Tyler Cooke, who marks his third season with the BMW aftermarket and tuning specialists, and new BimmerWorld driver Andrie Hartanto, who brings years of regional touring car experience to the No. 81 BMW. BimmerWorld spent the 2014 ST Championship developing the F30 platform as the future model of choice in IMSA’s top-tier production-based series, and as Clay explains, 2015 should be the year where BMW’s forced-induction drivetrain and renowned handling combine for great success. Clay’s team made headlines as the first North American racing team to win with the BMW 328 E90 chassis, and expects to put all of BimmerWorld’s BMW build and development expertise into achieving the same outcome with the F30. “We have played with turbos for a while now, but in keeping with the mantra of our company, racing a product is really what pushes our boundaries and allows us to really learn at the limits of a car,” he explained. Making the complete shift from E90s to F30s will be aided with consistency in the cockpit of the No. 84. Briedis is aiming higher than ever as he looks to the new season. Cooke spent two seasons learning from BimmerWorld’s Greg Liefooghe, who will move to a different car within Clay’s racing operations next year, and with the chance to demonstrate everything he’s learned, the emerging pro is looking forward to sharing the No. 81 with Hartanto. “I am ready to take the leadership role along with Andrie, and I’ve already learned a lot from Greg, and all the people at BimmerWorld,” he said. “I’m ready to make my third year with the team an even bigger success after running in the top-5 all last year. And I’m excited to be in the new F30 chassis after seeing their potential last year. Hartanto has extensive chassis building, development and racing experience that will be invaluable for the No. 81 entry, and says stepping up to Street Tuner with BimmerWorld is the culmination of everything he’s worked towards. 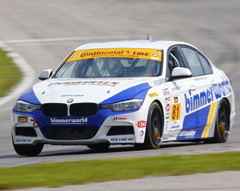 “It has always a dream of mine to run a full season in professional racing, and to join such an established and competitive team like BimmerWorld Racing is icing on the cake,” he said. “While I’ve been racing for a number of years and have even dabbled in professional racing, I’m still a rookie. I’m excited to learn a lot from Tyler and my other teammates, James and Jason. 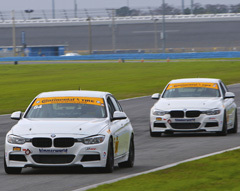 Follow the BimmerWorld Racing team as they prepare for the first official test of 2015 at Daytona International Speedway on Jan. 9-11 by visiting www.BimmerWorldRacing.com.